The House of Arts renewed both its look and its functionality and was the venue for the ministerial sessions of the European Union for half a year. Organising events at the highest standard is ensured by the state-of-the art technical background, stylish interior and the variability of inner space. Our theatre hall with a capacity of hosting almost 400 people, our conference room which can host 230 people and our rooms of different size make this place an ideal venue for organising conferences, company and business events or trainings. On demand we undertake a complete event organisation, help with decoration, catering or programme organisation. As there is a wide range of programmes in and around Gödöllőn, we can put together various attractive packages. Apart from organising the event and renting the venue, there is an opportunity to visit the Palace, have horse programmes (horse show, coach driving race, farm Olympics) try dinky line, airsoft, hiking, or visit a bear farm, an adventure park or a wellness spa. The House of Arts also hosts six different ART GROUPS so our programme repertoire can be expanded with the production of local musical or dance groups. 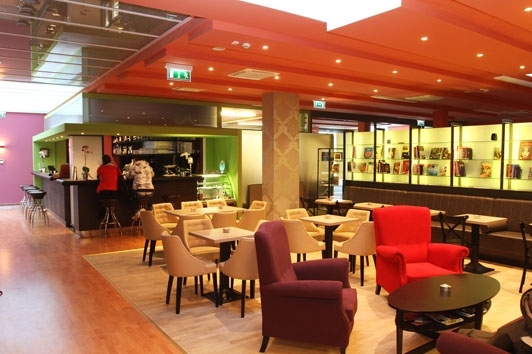 The hotel Erzsébet Királyné Szálloda, which is located 150 m from the House of Arts, can accommodate 130 people in 62 intimate, air-conditioned standard and superior category rooms. At the other pensions and accommodation facilities of Gödöllő another 300 people can be housed. A parking place with a capacity for 105 cars is located 20 m from the House of Arts to welcome the motorists. We ensure organising events at the highest standard due to our state-of-the art 21st century technical equipment and technicians. Our technical equipment: built-in public-address system, projector, screen, table and cordless microphones, theatre hall lighting and public-address sytem, rostrum, a 20 m2 mobile stage with 30 or 60-100 cm adjustable legs, flipchart and other technical accessories. On demand we can offer translator machines. We are waiting for our guests with a wide range of diverse gastronomic choices, cold and hot dishes satisfactory to all demands and with the most popular tastes of our national and also of international cuisines. You can have seated or buffet dinners, the latter can be organised also outdoor, in the inner yard of the House of Arts. Other: on demand we can offer cloakroom, information desk and ticket office for events.